Bringing home a bad apple or two from the grocery store might not seem like a huge deal to the average consumer. But for producers and sellers of fresh fruits and vegetables, the staggering 40% of food that goes bad before it even reaches a store means mounds of wasted food and nearly $1 trillion in lost profits. 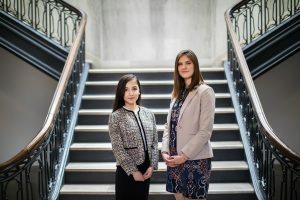 Now, thanks to a 2019 President’s Innovation Prize (PIP) award, seniors Katherine Sizov of Alexandria, Virginia, and Malika Shukurova of Samarkand, Uzbekistan, plan to address the issue and optimize the produce supply chain. The prize will help them grow their novel biosensing technology startup company Strella Biotechnology. Sizov, who is majoring in molecular biology, likes to ask everyone the same question when talking about Strella: “How old do you think an apple in a grocery store is?” As it turns out, an apple from a store may have been in storage anywhere from a couple months to up to more than a year. “That’s one fact that you don’t really consider when you go into a store because you’re so used to seeing fresh fruit,” she says. The idea for Strella came to life when Sizov, who was previously doing undergraduate research on neurodegenerative disorders, found herself reading papers outside of her main area of study and chatting with Shukurova about what she learned about food waste. The two friends had met during freshmen year through the Penn Russian Club. Shukurova, a bioengineering major, quickly became interested in seeking a solution with Sizov. 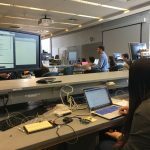 “At that time I was becoming increasingly interested in the technical aspects [of the problem], and more focused towards building a solution by sensing,” she says. Their complementary areas of technical expertise, and two years of friendship, led to a collaboration. They soon found a potential approach: Ripening fruits release ethylene gas, and the amount of the gas correlates with a fruit’s ripeness. The challenge, however, is that man-made compounds do not bind ethylene with much specificity, so it’s a difficult gas to measure. Strella’s solution? “Hack the fruit,” says Sizov, explaining that fruits can already measure ethylene themselves. Placing a ripe banana next to an unripe banana, for example, causes the unripe fruit to ripen more quickly. “Why reinvent the wheel? Let’s use what a fruit uses to sense ethylene,” she says. 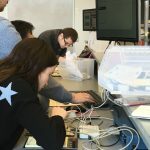 After Sizov “hacked” the fruit and had a potential biosensor in hand, Shukurova’s experience and technical knowledge in bioengineering gave her knowledge on both the electronic and biological aspects of the problem. Their patent-pending sensor is now a “leading ripeness indicator” that Strella can monitor on a constant basis. But bringing their biosensor to market means overcoming technical and biological challenges, including biosensor stability and powering the electrical components that collect data. Sizov and Shukurova put together a team of people with complementary knowledge, including Zuyang Liu, an electrical engineering master’s student; Reggie Lamaute, an undergraduate studying chemistry and nanotechnology; and Jay Jordan, who has previous experience in sales and market development in agriculture. Strella biotechnology came together thanks to a number of programs and resources at Penn, including the Wharton VIP-Xcelerate, the Wharton VIP Fellows program, Weiss Tech House, the Wharton Undergraduate Entrepreneurship Club, the Penn Engineering Miller Innovation Fellowship, and courses offered as part of the Engineering and Entrepreneurship Program. Sizov and Shukurova also say that Penn’s openness to innovation and the numerous resources for would-be entrepreneurs has expedited their success. Mentorship was also crucial for the success of their startup, with both naming Sevile Mannickarottu and their PIP mentor, Jeffrey Babin, as instrumental resources. Babin, who first met Sizov when she took his engineering entrepreneurship lab and who later served as her Wharton accelerator program advisor, says that Sizov was able to take skills she gained in the classroom and directly apply them in business scenarios. “She’s fearless in terms of picking up the phone and talking to strangers, gauging the market place, and taking on the tough issues in starting a company,” he says. Continue reading at Penn Today. 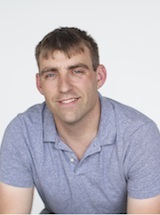 The Department of Bioengineering would like to congratulate our very own Jason A. Burdick, Ph. D., on being awarded the Acta Biomaterialia Silver Medal. 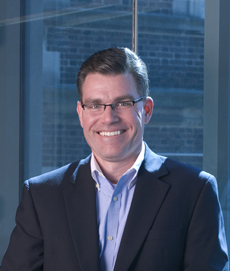 Dr. Burdick is the Robert D. Bent Professor and a member of both the Laboratory for Research on the Structure of Matter (LRSM) and Center for Engineering Mechanobiology (CEMB) here at Penn. The Acta Biomaterialia Silver Medal is an award from the monthly peer-reviewed scientific journal Acta Biomaterialia that recognizes leaders in academia, industry, and the public sector for mid-career leadership in and significant contribution to the field of biomaterials engineering. Dr. Burdick is the third recipient of the award so far, which includes a silver medal, an inscribed certificate, and reward of $5000. 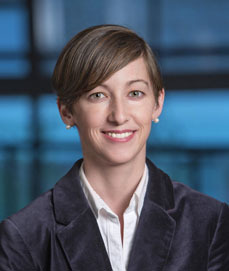 As the principal investigator of the Polymeric Biomaterials Laboratory in Penn’s Department of Bioengineering, Dr. Burdick leads research with a focus in polymer design, musculoskeletal tissue engineering, the control of stem cells with material cues, and the control of molecule delivery with polymers. 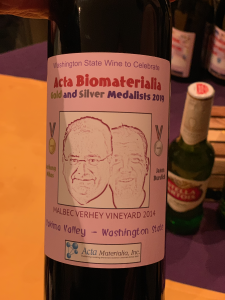 The Silver and Gold Medalists (Dr. Burdick and Dr. Antonios G. Mikos respectively) were presented with their own brand of wine in celebration of their achievement. 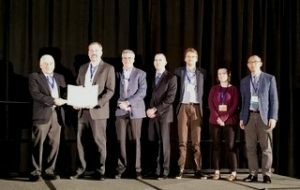 Specifically, Dr. Burdick’s innovation in the application of hydrogels to the musculoskeletal and cardiovascular systems brought him recognition for this award. His recent publications in Acta Biomaterialia include a study of bioactive factors for cartilage repair and regenesis in collaboration with fellow Penn Professor of Bioengineering Robert Mauck, Ph. D, and a study of adhesive biolinks that mimic the behavior of the extracellular matrix. The Acta Biomaterialia Silver Medal is only the most recent of several awards that Dr. Burdick has received, including both the George H. Heilmeier Faculty Award for Excellence in Research and the Clemson Award for Basic Research, and we can’t wait to see where his continued innovation in biomaterial engineering will take him next. Early on the morning of April 26, a SpaceX Falcon 9 rocket will launch a cargo mission to the ISS from Cape Canaveral Air Force Station. Along with fresh water, food, and other necessities for the crew, the craft will be carrying two experiments designed by Penn scientists that could help shed light on why bugs have bedeviled space travelers. For more than a decade, Dan Huh, the Wilf Family Term Assistant Professor of Bioengineering in the School of Engineering and Applied Science, has been developing super-small devices that use living cells to stand in for larger organs. These organs-on-a-chip hold great promise for all kinds of research, from diagnosing disease to curing them. They’re also a way to test things, including drugs and cosmetics, in a way that mimics real life without relying on animal subjects. Read the full story at Penn Today. Media contact Gwyneth K. Shaw. 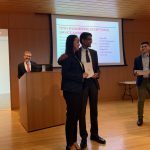 The Department of Bioengineering is proud to congratulate two of our graduating seniors on their 2019 President’s Engagement Prize and President’s Innovation Prize. 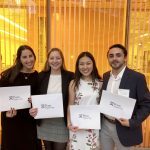 Awarded annually, the Prizes empower students to design and undertake post-graduation projects that make a positive, lasting difference in the world. Each Prize-winning project will receive $1000,000, as well as $50,000 living stipend per team member. 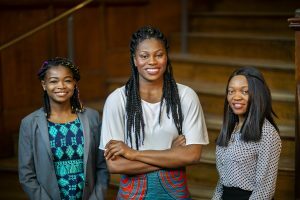 BE senior Oladunni Alomaja (BSE 2019) and her partners Princess Aghayere and Summer Kollie won a President’s Engagement Prize for Rebound Liberia. Ola and her partners will use basketball as a tool to bridge the literacy gap between men and women and as a mechanism for youth to cope with the trauma and stress of daily life in post-conflict Liberia. Rebound Liberia will build an indoor basketball court in conjunction with a community resource center, and its annual three-month summer program will combine basketball clinics with daily reading and writing sessions and personal development workshops. The team is being mentored by Ocek Eke, director of global and local service-learning programs in the School of Engineering and Applied Science. 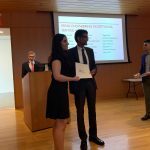 BE senior Malika Shukurova (BSE 2019, also pursuing a MSE in BE) and her partner Katherine Sizov won a President’s Innovation Prize for Strella Biotechnology. Strella is developing a bio-sensor that can predict the maturity of virtually any fresh fruit. Strella’s sensors are installed in controlled atmosphere storage rooms, monitoring apples as they ripen. This enables packers and distributors to identify the ripest apples and fruit for their customers, thus minimizing spoilage and food waste and promoting sustainability. Strella’s current market is U.S apple packers and distributors, which represent a $4 billion produce industry. The startup is looking to expand to other markets, such as bananas and pears, in the future. Malika and Katherine are being mentored by Jeffrey Babin, Practice Professor and Associate Director of the Engineering Entrepreneurship Program. Katherine, a Biology major in the College of Arts and Sciences, developed the company as a sophomore in the George H. Stephenson Foundation Educational Laboratory, the primary teaching lab for the Department of Bioengineering. 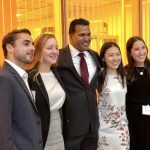 Another winner of the President’s Innovation Prize, Wharton student Michael Wong for InstaHub, also has BE connections: One of the co-founders, Oladayo (Dayo) Adewole, graduated with a BSE in Bioengineering in 2015, went on to achieve his master’s in Robotics, and is currently back in BE pursuing his PhD. InstaHub’s mission is to eliminate energy waste through snap-on automation that enhances, rather than replaces, existing building infrastructure. 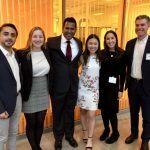 Founded at Penn in 2016, InstaHub is focused on fighting climate change through energy conservation efforts with cleantech building automation technology. The initial development work for InstaHub was also done in the George H. Stephenson lab here in BE. Congratulations once again to all the winners of this year’s President’s Engagement Prize and President’s Innovation Prize! 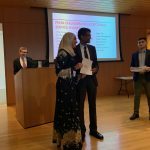 Read more about the awards and all the winners at Penn Today and the Penn Engineering Medium Blog. 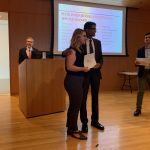 Each spring, the School of Engineering and Applied Science at the University of Pennsylvania hosts an awards recognition dinner to honor exceptional work in the school: The Faculty honor students for outstanding service and academics, while the students choose faculty members for their commitment to teaching and advising. 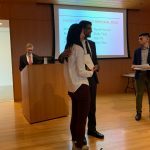 This year, the Department of Bioengineering won big with honors for both our Department Chair and our undergraduates. Read about each of the award winners and see photos from the awards ceremony below. Congratulations to all the winners! Dr. David F. Meaney, Solomon R. Pollack Professor and Chair of Bioengineering, was awarded with the Ford Motor Company Award for Faculty Advising, which recognizes “dedication to helping students realize their educational, career and personal goals.” Dr. Meaney is beloved by the students in BE for his engaging teaching style, his commitment to student wellness and advancement, as well as his weekly Penn Bioengineering spin classes, and so we are delighted to see him recognized in this way by the wider student body Read more about the award here and Dr. Meaney here. The Hugo Otto Wolf Memorial Prize, awarded to one or more members of each department’s senior class, distinguishes students who meet with great approval of the professors at large through “thoroughness and originality” in their work. This year, BE chose to share the award between Ethan Zhao (BSE 2019) and Shelly Teng (BSE 2019). 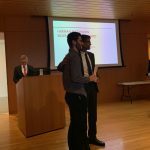 The Herman P. Schwan Award is decided by the Bioengineering Department and honors a graduating senior who demonstrates the “highest standards of scholarship and academic achievement.” The 2019 recipient of the Schwan Award is Joseph Maggiore (BSE 2019). Every year, four BE students are recognized with Exceptional Service Awards for their outstanding service to the University and their larger communities. 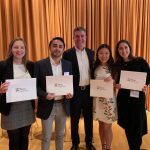 Our winners this year are Dana Abulez (BSE 2019), Daphne Cheung (BSE 2019), Lamis Elsawah (BSE 2019), and Kayla Prezelski (BSE 2019). All four of these recipients are also currently in the Accelerated Master’s program in BE. 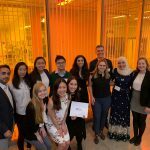 And finally, BE also awards a single lab group (four students) with the Albert Giandomenico Award which reflects their “teamwork, leadership, creativity, and knowledge applied to discovery-based learning in the laboratory.” This year’s group consists of Caroline Atkinson (BSE 2019), Shuting (Sarah) Cai (BSE 2019), Rebecca Kellner (BSE 2019), and Harrison Troche (BSE 2019). A full list of SEAS award descriptions and recipients can be found here. Every undergraduate student pursuing a B.S.E. 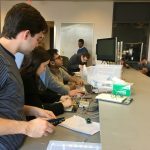 in Bioengineering participates in the Bioengineering Modeling, Analysis, and Design Laboratory I & II courses, in which students work together on a series of lab-based design challenges with an emphasis on model development and statistical analysis. Recently, junior undergraduates enrolled in this course taught by Dr. Brian Chow and Dr. David Issadore (both of whom recently received tenure) completed a project involving the use of electrocardiography (ECG) to innovate a non-invasive fatigue-monitoring device for astronauts that tend to fall asleep during long operations in space. 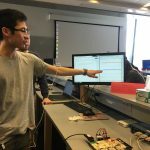 Using ECG lead wires and electrodes with a BioPac M-35 data collection apparatus, students collected raw data of their own heart and respiration rates, and loaded the data into MATLAB to analyze and calculate information like the heart rate itself, and portions of it like the QT-interval. 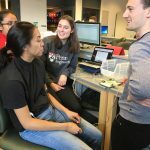 “I think it was cool that we could measure signals from our own body and analyze it in a way that let us use it for a real-world application,” said junior Melanie Hillman about the project. 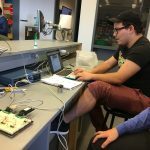 After taking these preliminary measurements, students used a combination of circuitry, MATLAB, and data acquisition boards to create both passive and active filters for the input signals. These filters helped separate the user’s breathing rate, which occurs at lower frequencies, from the heart rate, which occurs at higher frequencies, allowing for the data to be read and analyzed more easily. 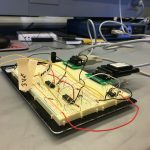 In their final design, most students used an active filter circuit chip that combined hardware with software to create bandpass filters of different frequency ranges for both input signals. 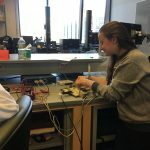 “It was nice to be able to do a lab that connected different aspects of engineering in the sense that we both electronically built circuits, and also modeled them theoretically, because normally there’s a separation between those two domains,” said junior Emily Johnson. On the final day of the project, Demo Day, groups displayed their designs ability to take one input from the ECG cables connected to a user, and filter it out into recognizable heart and respiration rates on the computer. This project, conducted in the in the Stephenson Foundation Bioengineering Educational Laboratory here at the University of Pennsylvania’s Department of Bioengineering, is just one of many examples of the way this hallmark course of the bioengineering curriculum strives to bring together all aspects of students’ foundational engineering coursework into applications with significance in the real world. 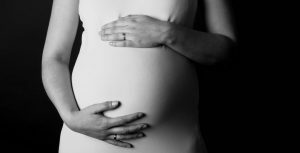 Preeclampsia is potentially life-threatening pregnancy disorder that typically occurs in about 200,000 expectant mothers every year. With symptoms of high blood pressure, swelling of the hands and feet, and protein presence in urine, preeclampsia is usually treatable if diagnosed early enough. However, current methods for diagnosis involve invasive procedures like cordocentesis, a procedure which takes a sample of fetal blood. Researchers at Tulane School of Medicine led by assistant professor of bioengineering Carolyn Bayer, Ph.D., hope to improve diagnostics for preeclampsia with the use of spectral photoacoustic imaging. Using this technique, Bayer’s team noticed a nearly 12 percent decrease in placental oxygenation in rats with induced preeclampsia when compared to normal pregnant rats after only two days. If success in using this imaging technology continues at the clinical level, Bayer plans to find more applications of it in the detection and diagnosis of breast and ovarian cancers as well. Two groups of researchers from the University of California, Berkeley and the Keck Graduate Institute of the Claremont Colleges recently collaborated to design what they call a “CRISPR-Chip” – a combination of the CRISPR-Cas9 System with a graphene transistor to sequence DNA for the purpose of genetic mutation diagnosis. While companies like 23andMe made genetic testing and analysis more common and accessible for the general public in recent years, the CRISPR-Chip looks to streamline the technology even more. This new chip eliminates the long and expensive amplification process involved in the typical polymerase chain reaction (PCR) used to read DNA sequences. In doing so, the CRISPR-Chip is much more of a point-of-care diagnostic, having the ability to quickly detect a given mutation or sequence when given a pure DNA sample. Led by Kiana Aran, Ph.D., the research team behind the CRISPR-Chip hopes that this new combination of nanoelectronics and modern biology will allow for a new world of possibilities in personalized medicine. Depression is one of the most common mental health disorders in the United States, with nearly 3 million cases every year. For most patients suffering from depression, treatment involves prolonged psychotherapy, antidepressant medication, or even electroconvulsive therapy in extreme cases. Now, scientists at the University of North Carolina School of Medicine study the use of transcranial alternating current stimulation (tACS) to alleviate symptoms of depression. Led by Flavio Frohlich, Ph.D., who has an adjunct appointment in biomedical engineering, this team of researchers based this new solution on information from each patient’s specific alpha oscillations, which are a kind of wave that can be detected by an electroencephalogram (EEG). Those who suffer from depression tend to have imbalanced alpha oscillations, so Frohlich and his team sought to use tACS to restore this balance in those patients. After seeing positive results from data collected two weeks after patients in a clinical trial receives the tACS treatment, Frohlich hopes that future applications will include treatment for even more mental health disorders and psychiatric illnesses. 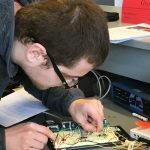 Engineers at the University of Utah are part of team that recently received a $9.7 million grant from the National Institute of Health (NIH) to design new implantable hearing devices for deaf patients, with the hope to improve beyond the sound quality of existing devices. The work will build upon a previous project at the University of Utah called the Utah Electrode Array, a brain-computer interface originally developed by Richard Normann, Ph.D., that can send and receive neural impulses to and from the brain. This new device will differ from a typical cochlear implant because the Utah Electrode Array assembly will be attached directly to the auditory nerve instead of the cochlea, providing the patient with a much higher resolution of sound. Read the rest of the story on Penn Engineering’s Medium blog. We would also like to congratulate Jay Goldberg, Ph.D., from Marquette University on his election as a fellow to the National Academy of Inventors. Nominated largely for his six patents involving medical devices, Goldberg also brings this innovation to his courses. One in particular called Clinical Issues in Biomedical Engineering Design allows junior and senior undergraduates to observe the use of technology in clinical settings like the operating room, in an effort to get students thinking about how to improve the use of medical devices in these areas. When we think of treatments at the cellular level, we most often think of biochemical applications. But what if we began to consider more biomechanical-oriented approaches in the regulation of cellular life and death? Under a grant from the National Science Foundation (NSF),Worcester Polytechnic Institute’s (WPI) Head of the Department of Biomedical Engineering Kristen Billiar, Ph.D., performs research that looks at the way mechanical stimuli can affect and trigger programmed cell death. Billiar, who received his M.S.E. 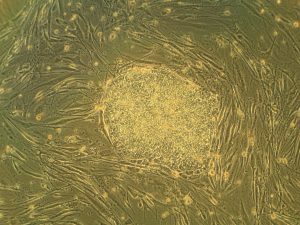 and Ph.D. from Penn, began his research by first noticing the way that cells typically respond to the mechanical stimuli in their everyday environment, such as pressure or stretching, with behaviors like migration, proliferation, or contraction. 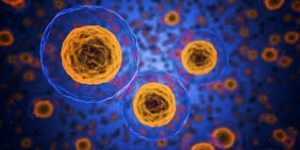 He and his research team hope to find a way to eventually predict and control cellular responses to their environment, which they hope could open doors to more forms of treatment for disorders like heart disease or cancer, where cellular behavior is directly linked to the cause of the disease. Obviously, one of the biggest challenges in the field of prosthetics is the extreme difficulty in creating a device that perfectly mimics whatever the device replaces for its user. Particularly with more complex designs that involve user-controlled motion for joints in the limbs or hands, the electrical circuits implemented are by no means a perfect replacement of the neural connections in the human body from brain to muscle. 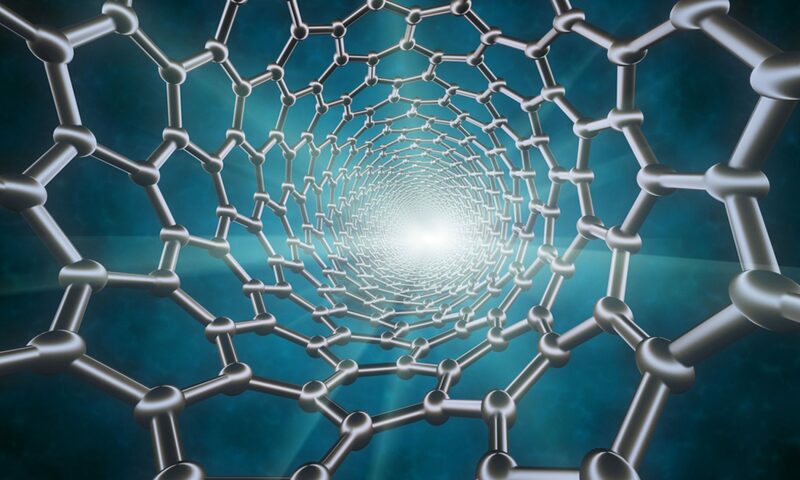 But recently at the University of Southern California Viterbi School of Engineering, a team of researchers led by Francisco J. Valero-Cuevas, Ph. D., developed an algorithm with the ability to learn new walking tasks and adapt to others without any additional programming. The algorithm will hopefully help to speed the progress of robotic interactions with the world, and thus allow for more adaptive technology in prosthetics, that responds to and learns with their users. The algorithm Valero-Cuevas and his team created takes inspiration from the cognition involved with babies and toddlers as they slowly learn how to walk, first through random free play and then from pulling on relevant prior experience. In a prosthetic leg, the algorithm could help the device adjust to its user’s habits and gait preferences, more closely mimicking the behavior of an actual human leg. We’re all familiar with the concept of being “in the zone,” or the feeling of extraordinary focus that we can sometimes have in situations of high-stress. But how can we understand this shift in mindset on a neuroengineering level? Using the principal of the Yerkes-Dodson law, which says that there is a state of brain arousal that is optimal for behavioral performance, a team of biomedical engineering researchers at Columbia University hope to find ways of applying neurofeedback to improving this performance in demanding high-stress tasks. Led by Paul Sajda, Ph.D., who received his doctoral degree from Penn, the researchers used a brain-computer interface to collect electroencephalography (EEG) signals from users immersed in virtual reality aerial navigation tasks of varying difficulty levels. In doing so, they were able to make connections between stressful situations and brain activity as transmitted through the EEG data, adding to the understanding of how the Yerkes-Dodson law actually operates in the human body and eventually demonstrating that the use of neurofeedback reduced the neural state of arousal in patients. The hope is that neurofeedback may be used in the future to help treat emotional conditions like post-traumatic stress disorder (PTSD). Arthritis, an autoimmune disease that causes painful inflammation in the joints, is one of the more common diseases among older patients, with more than 3 million diagnosed cases in the United States every year. Though extreme measures like joint replacement surgery are one solution, most patients simply treat the pain with nonsteroidal anti-inflammatory drugs or the adoption of gentle exercise routines like yoga. Recently however, researchers at the University of Minnesota led by Daniel Zachs, M.S.E., in the Sensory Optimization and Neural Implant Coding Lab used ultrasound stimulation treatment as a way to reduce arthritic pain in mice. In collaboration with Medtronic, Zachs and his team found that this noninvasive ultrasound stimulation greatly decreased joint swelling in mice who received the treatment as opposed to those that did not. 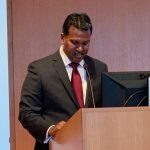 They hope that in the future, similar methods of noninvasive treatment will be able to be used for arthritic patients, who otherwise have to rely on surgical remedies for serious pain. To undergraduates at a large university, the administration can seem like a mysterious, all-powerful entity, creating policy that affects their lives but doesn’t always take into account the reality of their day-to-day experience. The Engineering Deans’ Advisory Board (EDAB) was designed to bridge that gap and give students a platform to communicate with key decision makers. The 13-member board meets once per week for 60 to 90 minutes. The executive board, comprised of four members, also meets weekly to plan out action items and brainstorm. Throughout his interactions with the group, board president Jonathan Chen, (ENG ‘19, W ‘19), has found a real kinship with his fellow board members, who he says work hard and enjoy one another’s company in equal measure. Bioengineering major Daphne Cheung (ENG’19) joined the board as a first-year student because she saw an opportunity to develop professional skills outside of the classroom. “For me, it was about trying to build a different kind of aptitude in areas such as project management, and learning how to work with different kinds of people, including students and faculty, and of course, the deans,” she says. Read the full story on Penn Engineering’s Medium Blog. Media contact Evan Lerner.